Yes, that and of course the big export of American jobs to China and Mexico and elsewhere. Face it -- you cannot have unlimited levels of illegal immigration when we already have the highest legal immigration numbers of any nation AND export most jobs without some effect. The whole housing bubble was about bringing in illegals to build cheap houses that would sell for too much and subprime loans required no social security number or proof of income for a reason. You know what was going on when $300,000 houses were sold to buyers making $8 an hour housekeeping and couldn't come up with a valid social security number. lol. thats all I have to say. If you haven't noticed, our global economy is collapsing before our eyes. It won't be a global economy for too much longer. Unlimited illegal immigration with the export of most American jobs is not sustainable. We all knew it would collapse, many of us didn't realize this soon. 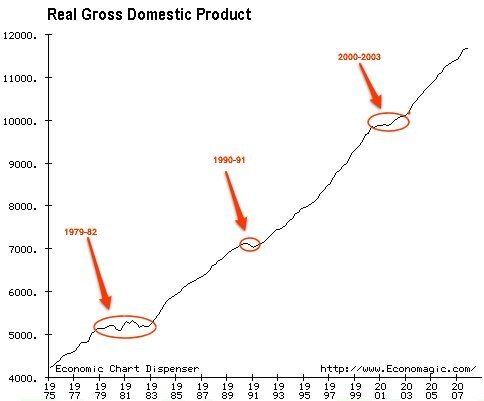 from 1979-1982 the economy was slow was not growing at all! a 5 trillion economy to 12 trillion. While we were learning new trades such as computers. are low skill jobs that we left had to be replaced and fast. or all those services requiring low trading skills werer going to start charging more to compensate for the fury to attract employees. I did not see illegals making quick profits selling their houses when they were value more and as result to put the country more in debt or to buy all those chinese goods, or driving a 50,000 humvee. I just think a lot of people that were beaten by the illegals for oppurtunities are the ones that are frustrated against them. the african american community was the scapegoat for all their problems and now the hispanics. where a nation of whiners. and that kind of attitude is not what america is made of. How much do you know about the global economic crisis? Are you just trying to squeeze in illegals, forcing them to fit as the reason for all of this? They even say illegal immigrants are responsible for global warming. Btw, this "study" was commissioned by the anti-immigrant CIS. Automation is one of the biggest reasons for growth not illegal labor. Illegal labor is a net drain on the US, maybe not in Countries that don't give away the amount of social services we do. i don't see where you have included our now falling GDP. i don't see where you have included our growing economic debt. i don't see where you have included the rising costs of health care or the rising costs of our prison population. i don't see where you have included our rising foreclosure rates for all of those homebuyers. you have left out so many factors that the data is totally irrelevant to the entire picture. i would also like to dispute your statement that the illegals became a force in 1978 with which you base your whole growth argument. Thats what I tell this folks, japan as an example no population growth rate, no immigration growth rate. What has japan done? develop taiwan, brazil, parts of mexico, even has started producing cars here in the usa. if it wasnt for immigrants and illegals all that capital had taken course a long time ago. But I do wish they get their wish, to see who they blame next. Where a cunsomer society and consume without mercy why do you think we buy from china instead of domestic products. but oh well. A lot of people that are against immigrants is just really not understanding the picture the government are trying to provide us. Good point by the way I like your chart. Don’t you mean “illegal” immigrants? Legal immigrants are not being paid below minimum wage or under the table (generally). Would you support slavery for optimum profit; or just our current quasi slavery? At least the plantation owners were responsible for maintaining their slave labor. Now, the taxpayers are forced to subsidize, while the ‘masters’ reap the profits. i don't see where you have included our now falling GDP?why need to whe did not complain when it was growing its a cycle. i don't see where you have included our growing economic debt?there you have it its called gdp to debt ratio i don't see where you have included the rising costs of health care or the rising costs of our prison population?baby booming clogging the system becaming to expansive even for us young people going to the emergency room and illegals wont be in jail if their main felony was to be caught working illegaly in the country proving more, either take them legally or enforce the laws better and as you can see during booming years we did not enforce them i don't see where you have included our rising foreclosure rates for all of those homebuyers?foreclosure rates it was the rich developing real state with cheap credit and making profits of the balloning results dont tell you have never met a neighbor who sold their house for a quick profit? now we want to blame that to the illegal to? you have left out so many factors that the data is totally irrelevant to the entire picture?thought you had common sense to look them up yourself. ?show you on the graph before this one in the 1970's is when illegals were started to come to the usa. leaving japan staganated and below per capita even to the usa standards. Thus, the three factors over which Washington had little realistic control—the growth of global ter­rorism and the need to respond with additional defense spending (1.2 percent of GDP), economic factors reducing tax revenues (0.5 percent of GDP), and net interest savings caused by lower interest rates (savings of 0.3 percent of GDP)—were enough to eliminate the 1.3 percent budget surplus. In other words, those external national security and economic events would have driven the budget into deficit even if President Bush and Congress had never reduced taxes by 1.0 percent of GDP and increased domestic spending by 1.1 percent of GDP. the bottompart. increase domestic spending by 1.1 percent of gdp. The illegals being around 20 million Ill give you that figure. infrastructure projects during that time? lol were a joke, we just like to blame people when we should blame our consumer habits. but even for the japs that isnt enough and you know why? china, taiwan, singapore, brazil, mexico and now even usa. 40 years of nurturing them with expensive tariffs to protect their native industries. Is that what you want? is that your scenario for america without immigration? they say a lot, without saying much of anything..